SYLVANIA Automotive Lighting ushers in a new era of vehicle lighting with the SYLVANIA ZEVOTM Automotive LED Lighting line, which brings the customized style and signature look of light-emitting diode (LED) technology on high-end vehicles to the aftermarket. Recent advancements in LED allow for aftermarket products to have the brightness and whiteness that original equipment (OE) LED products are known for – and the new product line from SYLVANIAmimics the lighting look on luxury vehicles – while still being street legal. The LED product line from SYLVANIA includes a unique fog daytime running light (DRL), 7-inch round (H6024 replacement) sealed beam retrofits, DRL pipe and pixel designs that do not need a switch, retrofit light sources for dome, map and license plate applications, and a wireless ambient light for interior applications. 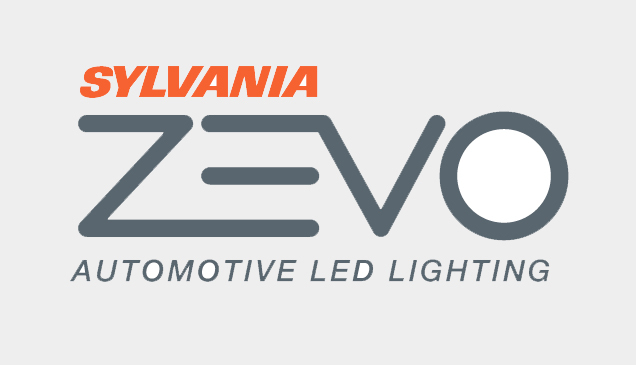 The SYLVANIA ZEVOTM Fog DRL is the industry’s first high performance fog light with a unique “C” shaped lightguide, offering a modern LED look while delivering street-legal OEM performance both day and night. The crisp, white LED provides a sleek style and automatically adjusts to day or night conditions with no extra controls or switches by sensing when the headlights are on. The SYLVANIA ZEVO Fog DRL is fully sealed and has been tested to meet IP67 standards to withstand extensive weather and washing. The SYLVANIA ZEVOTM Sealed Beam LED is a 7-inch round sealed beam replacement for existing H6024 halogen and 6014 incandescent headlights, found on older model Jeeps and Ford vehicles. With a street legal crisp, white light, it allows car enthusiasts to literally plug-and-play from a halogen system to a LED. The SYLVANIA ZEVO Sealed Beam LED has a shock resistant design, adjusts automatically, and senses when headlights are on. The SYLVANIA ZEVOTM DRL PIPE daylight running and accent light kit gives any vehicle extra character by providing a unique, light-piped LED look while delivering street-legal OEM performance. The 6200K crisp, white LED provides a sleek style, and it automatically adjusts to day or night conditions with no extra controls or switches by sensing when the headlights are on. DRK PIPES are fully sealed and have been tested to meet IP69 standards to withstand years of weather and washing. The SYLVANIA ZEVOTM DRL PIXEL daylight running and accent light kit adds a splash of LED to the exterior of any vehicle with five high-performance OSRAM LEDs in a modern pixilated look. With a color temperature of 5200K, it fits easily in the fascia of most cars. Like DRL PIPE, it adjusts automatically and senses when headlights are on. The kit has been tested to meet IP67 standards, so vehicle owners don’t have to worry about water damage caused by rain or washing. The SYLVANIA ZEVOTM Interior Strip Kit is a stylish and safe way to customize the interior of any vehicle. With easy installation and 16 color choices, a number of personalization options exist and can be changed quickly at the touch of a button via the kit’s remote control. The lights turn on automatically, have five lighting modes and come with a 12V car adaptor. With two extension kits available, enthusiasts can put20’of LED strips in one system. The SYLVANIA ZEVOTM LED Retrofit Lights for dome, map and license plate applications allow for easy replacement of those dingy, yellow incandescent bulbs with a brighter, whiter, sharper light source. A true plug-and-play replacement that features a color temperature of 6000K, the product adds a level of sophistication and style in a simple and cost-effective way.